The latching of the arrow insert into defined positions guarantees that the arrow remains in a fixed position. The main body of the stamp also remains at the same height as the arrow insert (therefore named ‘with fixed height’). The stamp can be easily removed at the split line face thanks to a withdrawal thread in the main body. 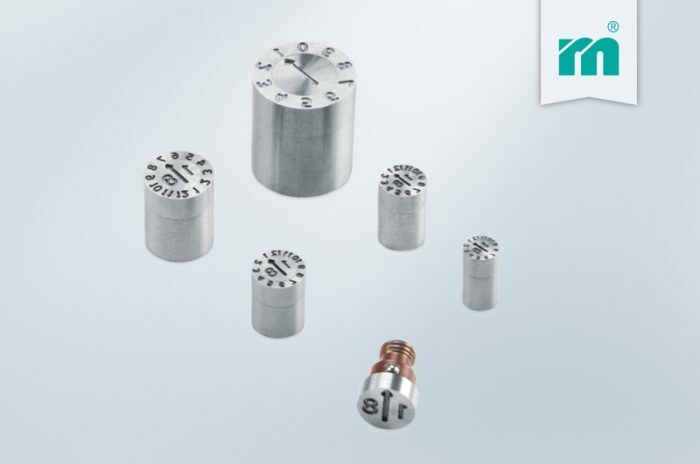 Made of stainless steel 1.4112 with a hardness of 52 HRC, the stamp can be used at temperatures up to 340°C. Thanks to the low installation height, it is also optimally suited for installation in very thin moulding plates. The new stamp is available in different variations: month (E 2420 R), year (E 2424 R), 0-9 (E 2422 R) as well as a blank main body for individual configuration (E 2429 R). The diameters range from 4 to 12 mm. As usual, the CAD data is available in the Meusburger web shop with just a few clicks.